By now you probably all realise that the Metal Gear files from our Agness Kaku interview are gone. Read on for an explanation, slightly odds tales about contacted by outside agencies, and also further insight from the lady herself. Plus some fresh translation material too. The reason for the file removal was, basically, we woke up and they were gone. Konami's legal department in Japan hit our host/provider with a DMCA take-down notice, and they were removed on our behalf. There wasn't even a fight to put up, it just happened and we were forwarded some legal emails. I was tempted repost them, but they're pretty dull. The best thing out of this though, is it was direct from KOJ's legal division, complete with awkward legal English. The news story was on 2chan and several Japanese blogs, so they obviously found about it and - I like to think - Kojima himself demanded the legal eagles take them down. If you didn't grab 'em, I'm afraid they're gone. The other interesting thing is I was contacted by INTAC directly (as explained in the interview this was the agency Konami dealt with). They said they were trying to understand what happened and asked for information about my interviewee, and I told them straight: as a journalist I'm not required to divulge any information regarding my sources. I never got a reply. What was interesting was the wording of the email - not threatening, but really bizarre, as if those of us running HG101 were kids. The hilarious thing is, all of the questions that I had been asked, were pretty much already answered by the article itself. I've also been chatting with Agness some more, which resulted in these interesting re-translations. For anyone who enjoyed the original interview, this should make a nice addendum. My two cents: these examples perfectly highlight the importance of good localisation. The direct translation in blue is stilted, drier and without any kind of flavour. It's just dull. The green on the other hand conveys the characters personalities a lot better - especially Snake's wry cynicism. It's a no brainer really. If you're converting anything which involves heavy use of language, from one language to another, it's extremely important to give the localiser the freedom required to make it work. Some interesting feedback I've read regarding the interview is people bringing up some of Squaresoft's localisation work, and how they worked hand-in-hand with localisers every step of the way, and citing Alexander Smith as someone allowed the freedom to do the job right. It's a great shame that Konami never saw fit to do the same, since besides Agness Kaku and Jeremy Blaustein, I've heard other rumblings regarding how they operate. I'm pasting Agness' email verbatim. What with everyone getting their MGS2 freak on, I decided to re-read the sample file I have linked off of Hibernium--the Tanker Chapter opening. It was a lot better than I remembered, so I looked up the original. Aha. Should have done this before the interview, since it answers your question about what exactly I meant by "mood-building and slapping on a good coat of noir". Lines from actual Japanese screenplay (taken from cached version of Kojima's blog and bunch of fan sites) is on top. For your amusement, I've done a direct translation in blue. Green is what I handed in. The Hudson River, two years ago... We got information that a new type of Metal Gear would be transported in top secret. Now that I think about it, we should have been suspicious. This is Snake. Can you hear me? Otakon? This is Snake. Do you read me, Otakon? Over. Yes, I can hear you. It's me, Snake. Loud and clear, Snake. Over. You kept me waiting! I've arrived at the sneak point. The stealth camo broke from the landing impact. S: Think I'd wait forever [the comment is directed to the player]? I'm at the infiltration point [SP for 'sneak point']. Over. O: Everything going okay? Over. S: The stealth camo's busted. Landing impact. Over. We did use it pretty hard... I'm sorry, but grin and bear it. This isn't the military. We did use the hell out of that thing. Sorry, but you're gonna have to deal. You're not in the military-industrial complex anymore, Dorothy. Yeah. I don't plan to relying on this forever. Right. I don't plan on relying on this gadget either way. Over. And you're not fed some strange drug. I'm happy as long as no one slips a Mickey Finn in the morning glass of OJ. You mean that thing with Naomi? It's also nice that there's no nagging minder. And I can't say I miss the chattering nanny. Mei Lin, huh. I'll ask her another favor. The new weapon from NATICK. Mei Lin's not so bad. That reminds me, I have to get in touch with her again about that new Natick flashware. Diverting from the Army Soldier Systems Center. Give her a message. It'll come out sometime. Tell her she should stop soon. Diverting toys from the SSCEN (U.S. Army Soldier Systems Center) again? Someone will find out, sooner or later. She's better off assuming it's sooner and quit while she's ahead. Tell her I said that. Another thing, avoid fighting as much as possible, The goal is to collect evidence of new Metal Gear development and publicize it. It would be the best if you could escape without being discovered. The mission objective is to make visual confirmation of the new Metal Gear being transported by that tanker and bring back photographic evidence. No destruction, please. Got it? I know that. We're not terrorists. Don't worry. I know the drill -- we're not terrorists. That's right. We are an anti-Metal gear foundation "Philanthropy". We're registered with the U.N. as an NGO. Very good. We're a 100% UN-recognized 'Opposition to Metal Gear' aka OMEGA*. Don't you forget that you're a part of an NGO and can chew granola with the best of them. Well, we're certainly a radical presence among NGOs. Recognized, but still fringe, Otakon. Kind of odd to realize how much people love the opening. Lots of quoting of the "noses had been out in the cold too long" line. So much for standing up to C&D letters. KOJ probably hid a transponder inside her weird hat. You should check and make sure she's not a Snatcher. Was briefly in love with you there, EvilPachirisu. Thanks for the much-needed laugh. I knit the hat myself, and it turned out not floppy-as-intended. I've named the thing Almost Arzach. Way super late and all, but many internet high fives for that reference. Arzach has the best hat. o_O That was fast, and unexpected. I didn't know HG101 was so popular in japan. If SOPA had passed, your whole website could be down by now. Good thing they just deleted the files. You could probably fight back, but I understand that would be too troublesome, and maybe even damaging. Unfortunately, DMCA is frequently used by these sort of corporations as a means of censorship. "I didn't know HG101 was so popular in japan. " I think people only realized about the article because someone on 4chan posted the interview on 2chan. I don't think HG101 is that well known in Japan. The thing about DMCA notices is that you can't really fight them. They don't contact the poster or even the editor directly, their MO is to go straight to the host, which is several steps above our hands. Even if we were to host them elsewhere the same thing would happen. Technically Konami is in their legal right to request the files taken down, even though such things are posted regularly amongst game history sites, and there's literally nothing to be gained by fighting it outside of foolish pride. The original taunts about C&Ds were more focused on whether they were trying to take them down on the grounds of them violating an NDA...which were never signed, according to the interview, so in the case they would have no right to request they be removed. Under copyright protection, they do though. @Discoalucard: Thanks for explaining. I still believe what we had here would fall under fair use. You gained nothing by posting it, and the text couldn't replace the actual product (In this case a game). More importantly, it was used to educate people about something. (About the localization of games). These are all indications of fair use. The suing company also has to show that you've made them lose earnings by publishing these files, which I doubt they could do. That's why you could probably use Fair Use as a defense. Still that would be a lot of hassle and going through it might be impossible for you. That's why I said they use DMCA as a means of censorship. There's no guarantee that the judge would consider this a fair use, that's why people are afraid of going to court and losing. Companies use this to effectively nullify fair use. The fact remains that even if we're in the right, it's far more trouble than it's worth. Ok seeing as no one else is talking about the blue green translations I thought I would make the first post about it. The blue is too devoid of personality but the green is too fan rewritey. You seriously over did the lingo. which one do I like better? Well the first one is boring and the second one makes me cringe. "classified intelligence" I think that's going a bit far in telling us how they got it. The wording seems to infer they got it from a someone that is part of the organization when the original leaves it vague. I think got a tip would of done better because it could of been from anywhere. "The whole thing stank" Over done, I think the whole thing didn't feel right works better. The rest is fine on this. "This is Snake. Do you read me, Otakon? Over." This is good, Snake would be more use to this lingo so it fits. Mostly posting this to show I don't hate it all, I will skip what I am fine with from now on. "Loud and clear, Snake. Over." should of gone with the literal with this one, would show Otakon is more civ scientist than hardened military. Brings out the personality more. "We did use the hell out of that thing. Sorry, but you're gonna have to deal. You're not in the military-industrial complex anymore, Dorothy." WAY over written, this also has a problem with later dialog saying he didn't like using it and wasn't planning on doing so anyway. The way he says it in your version is kinda like he is too good for it and never really uses it. Sure it could be inferring about the events of metal gear but I would think he is more talking about snake using it in their recent stuff. In the end the first one still has personality and isn't over written. "Right. I don't plan on relying on this gadget either way. Over." This changes the entire meaning of the comment, from snake liking it but knowing he isn't going to have it forever to Snake not liking it and saying he didn't need it. In the end the first one fits better because later in the series he gets another camo and loves the hell out of it. In the end this can be seen as an out of character momment. But you wouldn't know that because 4 hadn't come out yet, but then again its not your place to change such a detail in the first place. "I'm happy as long as no one slips a Mickey Finn in the morning glass of OJ." this was fine the original way it was, ugh you like to over do it don't you? And Finally "granola with the best of them."... No comment. In the end I hope you don't take this as an insult so much as a difference of opinion, a heated one but still a difference. I think there is a big difference between a localization and a rewrite. Also please excuse the grammar I am on a new nose spray that gives me headaches and I really don't feel like rereading my work, Actually why am I even writing this now? Oh well I already did so whatever. I think the blue ones are just fine. That's probably because I've gotten used to this kind of translations. The green ones are little bit over the top, but they're good too. Honestly, if publishers translate it, I usually don't care how they do it. Having some form of understanding what's going on is enough for me. The blue translation convey the meaning pretty well, and I have to admit the green ones try a bit too hard to sound like military men. Every localizer does their own thing differently. He or she basically gets the final say, so you're pretty much leaving it entirely up to their interpretation. I really don't care if she goes insane or not I am paying 60 bucks for this game as intended. I understand that she didn't have contact with the company much beyond "MAKE IT AS CLOSE TO THE ORIGINAL" which means they couldn't really okay or no way her stuff which is a shame but come on. The point of this is the end user, shes getting paid and in the end I am paying for the original product in English not hers. There is no such thing as the original product in English. The literal translation is by no means the more faithful; it's littered with idiot speak. Seriously, if your stomach doesn't turn at half the lines in blue, then I don't think you're even qualified to discuss the merit of any writing at all. And anyone who writes lines like "Mickey Finn in morning glass of OJ" and "chew granola with the best of them" isn't qualified to think of their self as an expert in well-written dialogue; seriously, some of Agness's dialogue is as "stylized" as the original lines are "boring"
Now now we want to be criticizing not insulting. We can disagree with what she does but we shouldn't be insulting, otherwise she will not take such comments to heart. hell she may not take them to heart at all. I made my point, you have to localize the text not rewrite it if that makes sense. Make it understandable and flow but keep it the same. I've played my way through a few Japanese RPGs with my limited ability, wishing they were in English. I've also gone through more dryly English-translated games than I care to count, and in every case I had wished the localiser had done more than do a straight translation. The European release of Agarest on PS3 is a good example. The political dialogue between generals was about as exciting as reading a transcription of a Houses of Parliament debate (ie: painfully boring). The US localisation was by a different team and they jazzed up the dialogue quite a bit. I've read quite a bit of feedback on this article, and several readers have stated they want direct literal translations for their games. My conclusion is anyone who wants this is the same kind of person who went and re-translated Chrono Trigger from Japanese to English, despite the official translation being regarded as one of the best (and when you read the translation notes, the things they changed were ridiculous). Or those fan-translators who re-translate games and insist on maintaining the Japanese grammatical structure, albeit with English words, in order for it to be more authentic. Which defies all normal logic. For all the crap Working Designs gets for messing with the scripts in games, they did some fine work on stuff like Popful Mail. The original Japanese was a fairly standard elven fantasy type story, but they really jazzed it up with jokes, funny names, wacky voices and a strong sense of fun. I'm not saying the MGS needs a localisation which turns it into a 100% spoof, but Working Designs' sterling work on Popful Mail always convinces me that localisation is more than simply converting WORD A into WORD B again and again. I've got another large Jeremy Blaustein interview due for HG101, and as he explains he had to rewrite all of the dialogue - and read all of Richard Marcinko's novels to get the military style down. And people love the original MGS translation, which wasn't a direct one. I'm convinced the "1-to-1 is best" argument doesn't hold much water these days. I don't want to sound like I'm trolling or anything, Sketcz, but have you considered that maybe, just maybe Jeremy Blaustein is potentially a better writer than Mrs. Kaku? That's probably why the MGS1 rewrite was better than the MGS2. I don't agree with the argument 1:1 translation is best either (just look at the dreadfully dull Euro translation of Solatorobo for Chrissakes) but I also don't agree with the argument that all translators are on the same footing. And to be perfectly fair, MGS2 was a stupid game (that had inspired moments) with a stupid story that I don't even think Jeremy could work his magic on. Given the quality of Ghost Babel's rewrites (read the Radio Play excerpt, it's great), and the high excellence of the Katamari series' writing, I think it's wrong to imply AK isn't a good writer. Obviously the tone and style were different, but I bought later copies of Katamari on the strength of writing alone. These snippets of opening (demo) dialogue are not indicative of the whole of MGS2. Konami took a much more hardline stance after MGS1, and more significantly the source material wasn't as good the second time around (as many others have already stated). As an interviewer for both localisers I realise it could appear as if I'm biased in their favour, but given what I've read, I think MGS2 would have benefitted from Konami actually caring about the end result more, plus freedom to apply some rather judicious use of a red marker to scrap/redo vast swathes of it. The JB interview will be going up soon, and during my time talking with both parties, their methods and intentions seem consistently similar - the Mei Ling Shakespeare quotes being an easy to cite example. As for not livening the MGS dialogue up, a guy shoots bees out of his mouth, the thematic setting to the game is pretty comedic to begin with. One to one is not the best no. But rewording is different than rewriting. And not all games need comedy. Some people like more serious games and just because others find that dull doesn't mean the designers should "Liven it up". Adding military terms etc isn't a bad thing unless it is a character that shouldn't use them, adding "Micky fin in the oj" just makes the character seem... Cheesey. I wouldn't call mgs cheese so much as off the wall. Theres a difference. I want to add that I think Agness is an absolutely brilliant writer. I have nothing but the greatest admiration for her and I really mean that. The interview was fantastic and should be read by anyone who has any interest in game production at all. AK7s insights were all spot on and the green/blue above should end any "debate" about the necessity for game translates to be given a free hand in the service of recreating the original "mood" precisely by rewriting. In this way, conversely, one stays closer to the original by rewriting then by slavishly and lazily following the original text. "My conclusion is anyone who wants this is the same kind of person who went and re-translated Chrono Trigger from Japanese to English, despite the official translation being regarded as one of the best (and when you read the translation notes, the things they changed were ridiculous)." If you're referring to the retranslation done by the guys at Chrono Compendium, you're misinterpreting its purpose. The goal of the project was to translate the script literally, even at the risk of sounding "awkward" or "unnatural", in order to be used as a source of information for those of us who don't know japanese. It was not meant to be a replacement of the original translation, and the guys that did it actually praised Woolsey's work while also taking into account the limitations he had to face at the time. Let's not forget that, Woolsey's changes aside, the original translation is censored and was limited by space issues. There's another translation done by someone named "Doctor L" that's based on their work, which is supposed to be more of a localization while still being faithful to the original script. Anyway... Personally, I agree with Piotyr, at least on a general basis. The way I see it, an ideal localization should attempt to be as close as possible to the original script while sounding "natural" in its new language. It's about keeping the story/setting intact while applying what I would call "common sense" to the actual text, nothing more than that. In my opinion, the translator shouldn't let his views of the original work affect the localization, much less change its content as if it were his own. It's not his work to judge said content, and the customers don't pay to read his personal perspective. I don't see how the idea of "improving" the original work is anything but disrespectful to its creator, not to mention the fact that any "improvement" done would be a subjective matter anyway. And just because someone asks for a faithful translation doesn't mean that it has to be a literal, "robot-like" one. There's a possible balance here that I don't see people taking into account. So... did anyone save & redistribute the Konami files then? I fell in love with the Star Wars movies the first time I saw them and it took many years and a lot of movie watching before I could see those movies for what they really are -- heavily flawed breakthroughs in imagination. I think a lot of the gamers who fell in love with the MGS series need time to see why this translator's work is clearly superior to what was released. Consider this: if the green lines had been used instead and you had just read the blue ones for the first time, what would you think of them? Incompetent crap, that's what! It's only because some people think of the blue lines as canonical that they are defended. And as for the argument that a more literal translation is somehow preferable, all I can say is try learning some Japanese. A literal translation is not even an option here. So let me get this straight. A guy from the company Konami gave you these files, because it was the desire of the company for you to have them and share them with the world, as these were never before seen by the public, and Konami realized that it was for the best if the world eventually could see these never before seen things. And then all of a sudden, the company changed their mind, and decided that the world should NOT see them? And even worse, instead of contacting you directly, they hacked your server and deleted the files themselves? I'm pretty late, but that's the farthest thing from "getting it straight" I've ever seen. 1.) Agness Kaku was never an employee of Konami. She worked for INTAC and got the MGS2 and Ghost Babel jobs as a contractor. 2.) Konami had no consent in releasing the files. Kaku never signed an NDA, so she can't be sued for doing so, but Konami still has the right to enforce copyright. 3.) Konami never did anything as absurd as "hacking the server and deleting the files themselves." They sent a DMCA copyright takedown request to the company hosting this site, and the host complied. 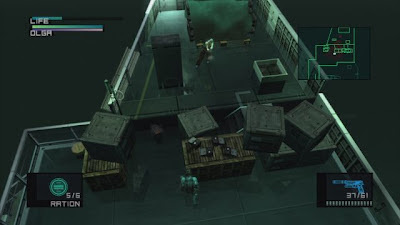 Also, while yes the owners of this site could dispute it and Konami would have to prove that the files actually caused a loss in revenue which would be almost impossible to do, they have technically sold the script of MGS2 (and other MGS games) as an individual product, most recently as a part of the MGS 25th Anniversary Book Collection. So, you could look at it from that angle.